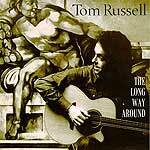 CD review: "The Long Way Around"
This review first appeared in the May 24, 1997 edition of the American Reporter. If you're wanting to hear Tom Russell on the radio, forget your local country station. Maybe the local public radio station will play him late at night, but you might even have to call into the nearest college station and request Russell to hear him over the airwaves. Which is too bad for country fans, because Tom Russell is not only one of the best songwriters in the nation, he's also a hell of a fine singer, with a rich baritone voice to rival Johnny Cash's. On his latest release, "The Long Way Around," Russell re-records 17 of his favorite songs from his career  and is joined on them by Nanci Griffith, Jimmie Dale Gilmore, Dave Alvin, Iris DeMent and Katy Moffatt. Now, if you've not heard of any of these folks (although even casual fans of country should know Griffith), then you should rush right out to the local CD shop and pick this up now  or order it if they don't have room for it in the bins next to Little Texas and the Pirates of the Mississippi. This is a fine cross-section of country's richest secret  the existence of a vibrant, creative underground as good as the Outlaw movement of the '70s. Russell has written quite a few gems over the years, and while he's never had a hit of his own, Suzy Boguss turned "Outbound Plane" into a Top 10 hit a few years back. Others have been covered by everyone from Cash to the Texas Tornadoes. But Russell remains the best interpreter of his own songs (which is not always the case). His new versions here of "Gallo del Cielo," "Halley's Comet" and "U.S. Steel" are wonderful readings all, bringing out new feelings and nuances not in his original versions. Of course, having the above singers join him for duets on most of the songs sure doesn't hurt. For a bonus, there is even a new Russell song here, "Big Water," recorded as a duet with DeMent. Look, one could fire off a whole year's worth of superlatives and still not come up with an adequate description of what Russell's music does to the listener. If you like traditional country music, or folk, or the wide musical prairie in between, then you'll dig this album.